Wallo™ Commercial-Sized Spring-loaded Round Ceiling/Wall Access Panels to be Carried by Menards Home Improvement Stores – Wallo Brands | Providing Quality and Value to Consumers Worldwide. Madison, WI. April 3rd, 2015 — Wallo Brands LLC’s round shaped, spring-loaded circular access panels will soon be available through Menards stores. The companies have inked an agreement that has Menards carrying the full line of Wallo’s revolutionary circular access panels in three sizes: 4.75” (home décor), 7” and 9” (commercial sizes). The product will be available starting in August 2015 in all 280 Menards stores throughout the Midwest. Since their introduction in 2012, Wallo’s easy snap-in, pop-out circular access panels for drywall ceilings and walls became an instant success with DIYers. (http://www.wallobrands.com). Recently, Wallo Brands took the next logical step and added two larger sizes to bring Wallo into the commercial and industrial market. Previously, there was only one, less-than-ideal way to access mechanical wiring hidden behind ceilings or walls: complex, cumbersome, hard-to-install framed access doors. 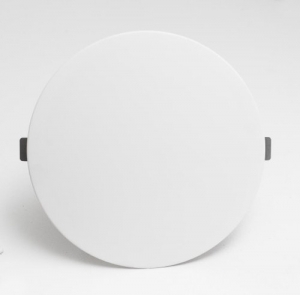 Wallo’s round ceiling access panels conveniently overcome this limitation by using spring-loaded clips instead of screws, latches, or fasteners. The Wallo label serves as the template for cutting the opening. The Wallo panel is round, so it’s easy to identify as an access panel rather than another ceiling tile. Menards customers will be able to preserve the finished look of drywall while providing quick and easy access to air dampers, plumbing, vents, electrical wiring, and the like. For example, the 9” panels are designed to access or install dampers such as the EzySlide (up to 6” round and 10” joist), Inserta Dampers, Balance Pro Dampers or equivalent brands/damper sizes. Provides permanent access to ductwork air damper controls, electrical junction boxes, etc. Satisfies New 2012 Building Codes Requirements. Does not require framing, screws, latches or fasteners –- great for the do-it-yourselfer. Spring-loaded clips make installation and removal of the panel a snap. Attractive — can be painted or wallpapered to match any existing room décor. Works in walls or ceilings up to ¾” thick. Product’s label serves as the template for cutting the opening. Three convenient sizes (4.75″, 7″ and 9″ diameters). For more information about Wallo products visit http://www.wallobrands.com or Facebook.com/AccessPanel. To locate the Menard’s store nearest you visit www.menards.com/main/storeLocater.html and use their easy-to-use Store Locator. Wallo panels can be purchased online through the Ceilingaccess.com and DrywallAccessPanels.com eStores. A family-owned company started in 1960, Menards® is headquartered in Eau Claire, Wisconsin and has more than 280 home improvement stores located in Illinois, Indiana, Iowa, Kansas, Kentucky, Michigan, Minnesota, Missouri, Nebraska, North Dakota, Ohio, South Dakota, Wisconsin and Wyoming. Today, Menards® is known throughout the home improvement industry as the low price leader; Menards’ famous slogan Save BIG Money!® is widely known and easy to remember. Menards® home improvement stores are conveniently located throughout the Midwest in a 14-state region. Menards® has something for everyone from the beginning do-it-yourselfer to the experienced contractor. 12 years of experience in residential and commercial construction, building maintenance, HVAC design, project management, and facility management. Wallo Brands round access panels selected as “Product of the Week” by The ACHR NEWS magazine! Wallo Brands | Providing Quality and Value to Consumers Worldwide.